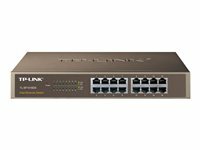 TP-Link plug-and-play Fast Ethernet 10/100 Unmanaged Desktop Switches are ideal for seamlessly expending an office or home office network. TP-Link's Green range can reduce power consumption by up to 70%. 5-Port 10/100Mbps Desktop Switch with 4-Port PoE provides the seamless network connection. It integrates 100Mbps Fast Ethernet and 10Mbps Ethernet network capabilities. TL-SF1005P has the priority* function which will help protect the system when the system power is overloaded. If all PoE PDs power consumption is >= 58W, a priority will be arranged among the PoE ports, then the system will cut off the power of the lowest-priority port. TL-SF1005P is easy to install and use. It requires no configuration and installation. 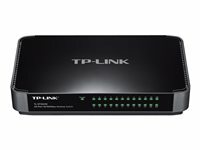 With desktop design, outstanding performance and quality, the TP-LINK TL-SF1005P 5-Port 10/100Mbps Desktop Switch with 4-Port PoE is a great selection for expanding your home or office network. The TL-SF1008D Fast Ethernet Switch is designed for SOHO (Small Office/Home Office) or workgroup users.. All 8 ports support auto MDI/MDIX, no need to worry about the cable type, simply plug and play. Moreover, with the innovative energy-efficient technology, the TL-SF1008D can save up to 73%* of the power consumption and 70% of the packaging material can be recycled, making it an eco-friendly solution for your business network. TL-SF1008D Fast Ethernet Switch provides 8 10/100Mbps Auto-Negotiation RJ45 ports. All ports support Auto MDI/MDIX function, eliminating the need for crossover cables or Uplink ports. Featuring non-blocking switching architecture, TL-SF1008D forwards and filters packets at full wire-speed for maximum throughput. With 10K Jumbo frame, the performance of large files transfers is improved significantly. And IEEE 802.3x flow control for Full Duplex mode and back pressure for Half Duplex mode alleviate the traffic congestion and make TL-SF1008D work reliably. 8-Port 10/100Mbps Desktop Switch with 4-Port PoE provides the seamless network connection. It integrates 100Mbps Fast Ethernet and 10Mbps Ethernet network capabilities. TL-SF1008P has the priority* function which will help protect the system when the system power is overloaded. If all PoE PDs power consumption is >= 53W, a priority will be arranged among the PoE ports, then the system will cut off the power of the lowest-priority port. TL-SF1008P is easy to install and use. It requires no configuration and installation. With desktop design, outstanding performance and quality, the TP-LINK TL-SF1008P 8-Port 10/100Mbps Desktop Switch with 4-Port PoE is a great selection for expanding your home or office network. The 16-Port 10/100Mbps Desktop/Rackmount Switch TL-SF1016DS provides you with a high-performance, low-cost, easy-to-use, seamless and standard upgrade to improve old network to 100Mbps network. All 16 ports support auto MDI/MDIX, no need to worry about the cable type, simply plug and play. Moreover, with the innovative energy-efficient technology, the TL-SF1016DS can save up to 75%* of the power consumption and 80% of the packaging material can be recycled, making it an eco-friendly solution for your business network. The rack-mount size steel case design, combined with a safety-certified internal power supply, make the switch the most robust product, which is very cost-effective for a less than 16-user environment. Featuring non-blocking switching architecture, TL-SF1016DS forwards and filters packets at full wire-speed for maximum throughput. And IEEE 802.3x flow control for Full Duplex mode and backpressure for Half Duplex mode alleviate the traffic congestion and make TL-SF1016DS work reliably. The auto features of this fast ethernet switch make installation plug and play and hassle-free. No configuring is required. Auto MDI/MDIX eliminates the need for crossover cables. Auto-negotiation on each port senses the link speed of a network device (10, 100Mbps) and intelligently adjusts for compatibility and optimal performance. This new generation 16-Port 10/100Mbps Switch TL-SF1016DS features the latest innovative energy-efficient technologies that can greatly expand your network capacity with much less power. It automatically adjusts power consumption according to the link status and cable length to limit the carbon footprint of your network. It also complies with the EU'S RoHS, prohibiting the use of certain hazardous materials. Besides, 80% of the packaging material can be recycled. This new generation 24-Port 10/100Mbps Switch TL-SF1024D features the latest innovative energy-efficient technologies that can greatly expand your network capacity with much less power. It automatically adjusts power consumption according to the link status and cable length to limit the carbon footprint of your network. It also complies with the EU'S RoHS, prohibiting the use of certain hazardous materials. Besides, 80% of the packaging material can be recycled. 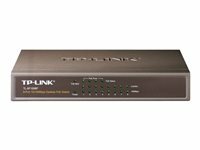 TP-LINK green technology TL-SF1024M Fast Ethernet Switch features the latest innovative energy-efficient technologies that can greatly expand your network capacity with much less power. It automatically adjusts power consumption according to the link status and cable length to limit the carbon footprint of your network.It also complies with the EU'S RoHS, prohibiting the use of certain hazardous materials. High performance TL-SF1024M Fast Ethernet Switch provides 24 10/100Mbps Auto-Negotiation RJ45 ports. All ports support Auto MDI/MDIX function, eliminating the need for crossover cables or Uplink ports. Featuring non-blocking switching architecture, TL-SF1024M forwards and filters packets at full wire-speed for maximum throughput. And IEEE 802.3x flow control for Full Duplex mode and backpressure for Half Duplex mode alleviate the traffic congestion and make TL-SF1024M work reliably. Easy to use The auto features of this switch make installation plug and play and hassle-free. No configuring is required. Auto MDI/MDIX eliminates the need for crossover cables. Auto-negotiation on each port senses the link speed of a network device (10, 100 Mbps) and intelligently adjusts for compatibility and optimal performance.